Sorry to say-you need to live here to hit every great spot recommended to us. However, I feel it my moral, culinary duty to share this list of restaurants as it was compiled from three highly trained, professional eaters (and drinkers). It should not go to waste. Let’s start with a friend of ours who lives in New York City. She’s a television producer who, at many points in her life, produced television shows about food. Naturally, you want to take her advice. Oysters and fantastic draft beer (and more) at The Publican. She’s right. We made it here for pork rinds, oysters, sardines on toast, cauliflower topped with prosciutto crumbs, homemade beer and milk panna cotta. Classic, superbly made Macaroons and freshly baked croissants at Vanille Patisserie. Cookies of ALL concoctions (like brownie chunks and potato chips in a cookie) in a fun retro setting with 70′s music at The Cookie Bar. Tried to go. NOTE-Closed on Sunday and Monday. Looks really fun inside. If you can handle gelato in the cold, go to Black Dog Gelato for some really divine flavors. 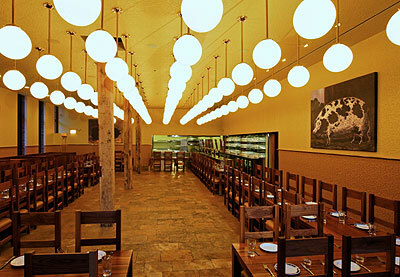 The Purple Pig–It’s on Magnificent Mile and is great — small plates, huge wine list, always hopping. Tried to go early on a Sunday-packed! The menu looked great. Urban Belly-Asian noodles and dumplings. Wonderful stuff, yummy ramen, very casual (shared long tables) super cool. Xoco-Authentic Mexican cafe (Rick Bayless, famous chef) with great sandwiches made to order and yummy hot chocolates with sweet churros that are made all day long and the most delicious ever. Open early and late. Went for breakfast for empanadas, huevos rancheros, spicy hot chocolate (no coffee) and churros. Just because we don’t usually eat doughnuts doesn’t mean we won’t. Mindy’s Hot Chocolate-The name is a bit misleading because it’s really all about the rest of the food. Nice family place. The chef is a former pastry chef turned restauranteur and she gets nominated for awards every year. Avec-This is the same owner as Publican but more upscale. Lovely, spare space. Really good dining. The Girl and the Goat-I actually haven’t been but it is supposed to be really good and always gets written up, and I love the name. The former pastry chef opened Black Dog Gelato. Crisp-Korean fried chicken. Foodies love this cheap eats place, say it’s the best fried chicken. 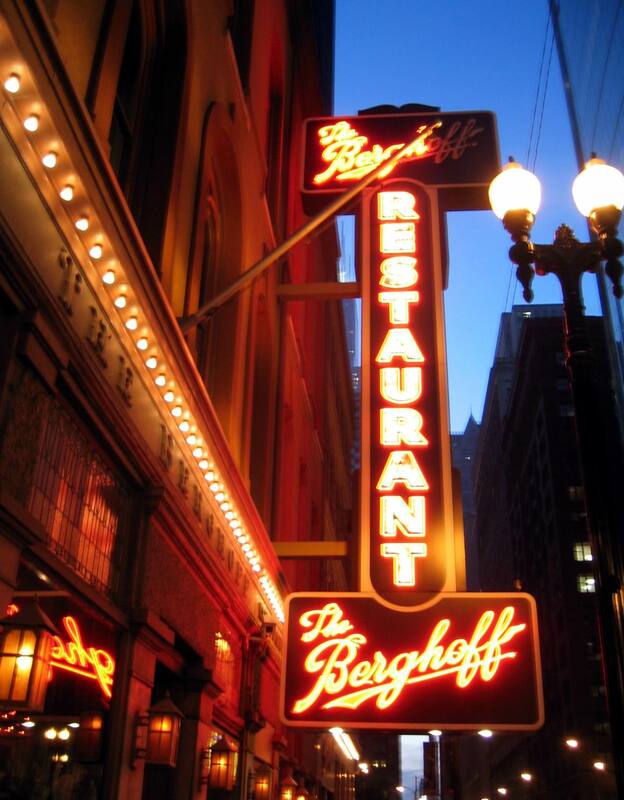 If you are downtown, and looking for a really old world experience, kind of fun— the famous Berghoff. We went to the cafe for lunch-old world, indeed. We had Berghoff root beer and eggplant parm in a cozy, Christmasy, German dining room. Do you like hot dogs? Go to Hot Doug’s. Another friend who lives in New York, works at a farm in the Hudson Valley. She pioneers programs for sustainable farming and cider production. She eats in delicious restaurants all over the country in the name of the food industry. I listen to her advice as well. Then there is my Father. While he’s not a food professional, he has an honorary degree from the University of Enjoying Food & Wine. His advice on food is analogous to Inès de La Fressange‘s advice on fashion: Classic. 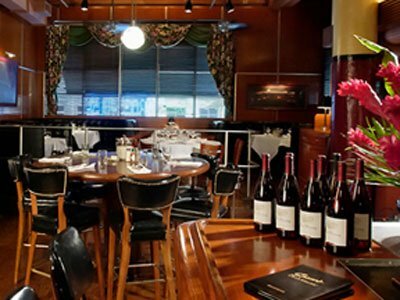 Our favorite spot in town; dark wood, crimson leather, black leather tufted booths-classic Chicago. We made it for oyster happy hour, salads and Caymus Conundrum. He didn’t tell me to go here but said I could if I wanted to. The birthplace of the famous SNL sketch of Cheezzeborger, Cheezzeborger, Cheezzeborger, Coke? still exists.